You are always told that you have a beautiful and dynamic personality, but somehow you always end up alone. The people around you are enamored by the quirks in your character but your sharp comebacks and flaws, often end up turning them off when they are in a relationship with you. 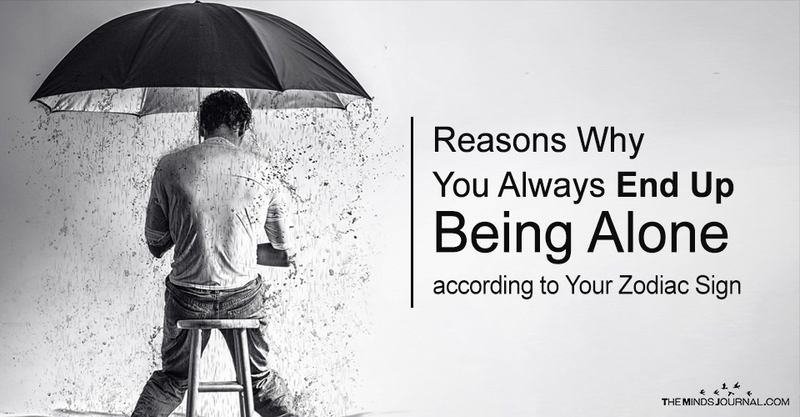 We compiled a list of the pros and cons of every Zodiac which play a major role in shaping you as you, and may point out some of the reasons where you go wrong and end up alone. You are a free spirit, and quite an overbearing one. Your partner soon realizes they have bitten off more than they can chew and your finicky and selective nature only makes you hard to be with, despite your energy and fiery personality. You’re the careful one, analytic and guarded. You want to know exactly what the deal is and that makes you rigorous and interrogative. Once your initial outward detachment wears off, your partner is affronted with your insecurity and clingyness in all its glory, which often makes me struggle to cut themselves away from you. Indecisive and with a duality inherent to your sign, you’re continually oscillating between choices, questioning your worth and when in a relationship, your nervous and fidgety version surfaces. Your brazen and insecure side scares your partner and your perceptual flitting from one decision to another can get on your partner’s nerves and cause them to detach themselves from you, despite your charisma and your flair for speech and vocabulary. Your nagging insecurities and inferiority complex can make you difficult to deal with; your constant need for reassurance from your partner about their love for you and your need to continually assuage your feelings of worthlessness makes you a handful. This makes most people wary of being in a relationship with you, and you often find yourself alone and lonely. Your egotistical self often cannot see past itself and that sometimes makes you blind to your partner’s characteristics. While the Leo is one of the most loved signs of the Zodiac for the quirks in their character, this can end up being a huge no-no for those in long-term relationships with them. Your obsession with yourself and inability to understand your mistakes often drive your fans and partners away. The perfectionists of the Zodiac, Virgos are always worried about and overly critical of things that do not match their vision and standard of perfection. External validation and opinions matter a lot to you and your super-high standards often make your partners unsure of themselves. They feel lesser and insufficient. Your obsession with fixing things and people and trying to clean up other people’s lives also often makes them uncomfortable and makes them move away. You’re always too busy pitying yourself to fully and openly love your partner. Your attitude of searching for ulterior motives and questioning people’s intentions can be frustrating and demeaning, and makes you less desirable to be in a relationship with. While you’re so involving warding off the world from hurting you, you turn out to be your biggest enemy when it comes to love. I’m a Scorpio and none of that is true with hold myself putting up a boundary driving people away. Total opposite effect. But I do know a cancer that fits this category perfectly with putting up a wall pushing people away big time.